The design department at Daimler-Motoren-Gesellschaft (DMG) – which had not yet merged with Benz & Cie – began developing Mercedes compressor vehicles in 1919. Gottlieb Daimler’s son Paul, who had succeeded Wilhelm Maybach as technical director and board member in 1907, drove the development work forward. DMG already had some experience with mechanical supercharging because compressor technology was used in aircraft and submarine engines. The first Mercedes compressor racing cars made their debut in 1922 at the Targa Florio in Sicily. They included, besides the 1.5-litre racing cars driven by Paul Scheef and Fernando Minoia, a Mercedes 28/95 PS, whose engine had been fitted with a compressor for this race and had an output of 140 bhp (103kw). With this car, Max Sailer secured a win in the category for series production cars with a cubic capacity of more than 4.5 litres. The Mercedes team went on to achieve overall victory in this important international race in 1924, when Christian Werner won in a 2.0-litre compressor racing car. A whole host of successes followed. 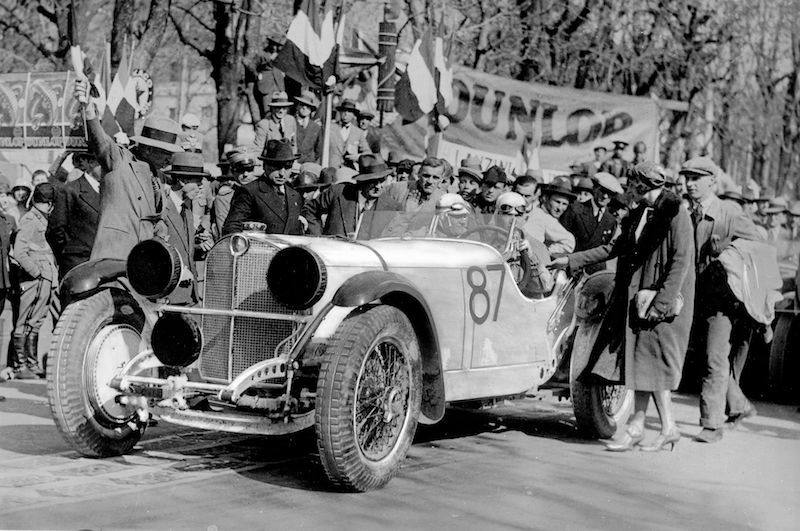 In 1926, Mercedes notched up another spectacular win with the 2.0-litre, eight-cylinder compressor racing car: 25-year-old Rudolf Caracciola took first place in the Grand Prix of Germany in Berlin with an average speed of 135 km/h – a pace that been considered completely impossible until then. The next generation of Mercedes-Benz competition cars were K, S and SS racing touring cars and, based on them, the SSK and SSKL racing cars. In contrast to the vehicles previously used, which had been intended purely as racing cars, the new cars were also designed to be sporty road cars. Commonly known as ‘white elephants’ and fitted with supercharged six-cylinder engines, they set the standard on normal roads and on race tracks worldwide between 1926 and 1933. These racing events were significant social occasions at that time. 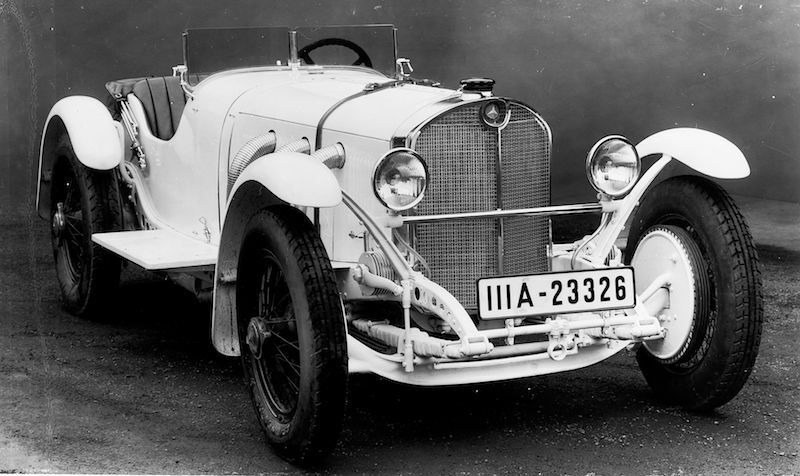 Development culminated in the Mercedes-Benz SSKL (Super-Sport-Kurz-Leicht or super-sport-short-light), which Caracciola drove in the Mille Miglia in April 1931. The SSKL was based on the SSK, whose short wheelbase made it very light and maneuverable. Also known as the ‘SSK, 1931 model’, the SSKL was even lighter – as indicated by the ‘L’ in its model designation. It weighed around 1,350kg, not much for a six-cylinder compressor car with a cubic capacity of 7,065cc and an output of 240 bhp (177kw) without and 300 bhp (221kw) with the compressor. The car’s maximum speed was up to 235 km/h. The final version to be developed of the formidable SSKL was entered in the 1932 Avus Race in Berlin. Private driver Manfred von Brauchitsch, who had decided to have the racing car fitted with a streamlined body, won the race with an average speed of 194.4 km/h. Start of the 1931 Mille Miglia. His Excellence Turatti gives the starting signal for Rudolf Caracciola and his co-driver Wilhelm Sebastian in a Mercedes-Benz SSKL racing car. Caracciola's wife Charly is also in the picture, to the right of the car. In research, I discovered that David Biggs of Clarksville Missouri USA, owned a Mercedes SSK L at one time. Being these special cars in time are so rare, does anybody know what ever happened to Biggs Car ? FYI – I have bookmarked this site because I discovered it distinctive and full of great content. I am really interested to see more stories. Thanks! I too enjoy Sports car Digest and bookmarked it also. The site covers many world automobile vintage events and some very fascinating automobiles in time. It brings forth many historical race and street cars that I enjoy researching. I Really enjoy just about all topics here and have real special interest in the earliest of streamlined race cars. The past articles/reporting on the Auto Union, Mercedes and the Maseratti at auction were cool.